Sandusky City Hall is located at 222 Meigs Street, Sandusky, OH 44870; phone: 419-627-5844. Photo: August Kuebeler House, ca. 1885, 1319 Tiffin Avenue, Sandusky, OH. Listed on the National Register of Historic Places in 1982. Photographed by User:Nyttend (own work), 2011, [cc0-by-1.0 (creativecommons.org/publicdomain/zero/1.0/deed.en], via Wikimedia Commons, accessed September, 2014. Sandusky was platted in 1818 and incorporated in 1824. It is in the western part of the Western Reserve known as the Firelands, because it was land set aside for those who were burned out during British raids on American coastal towns. Its plan was that of a typical New England town, centered around a square. The enthusiastic Mason who drew the plan, Hector Kilbourne, superimposed the triangle and square Masonic symbol on the grid design and created the diagonal streets and triangular parks. Located on the finest natural harbor on Lake Erie, Sandusky Bay, its early settlers came by water from the last. In 1835, the Mad River & Lake Erie Railroad began here. The railroad built housing to attract workers to the young community. 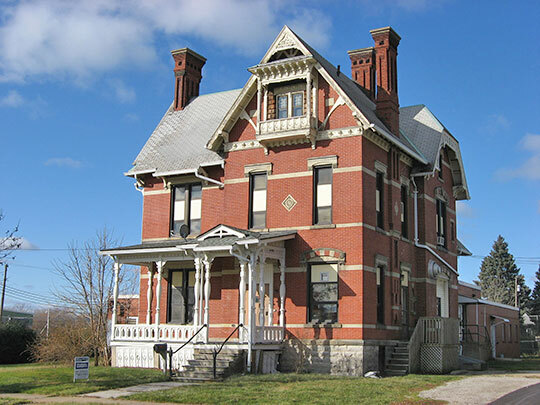 Other railroads followed, and in 1872 the Lake Shore & Michigan Southern Railroad began service through the south side of Sandusky, with an accompanying expansion of housing in this section of the community. A street railway company began operation in 1883, and houses and shops grew up along the lines. The Lake Shore Electric Railway from 1901 provided service from Toledo to Cleveland, south to Lima, and north to Detroit. Its general offices were here. Sandusky had a large influx of Irish and German settlers and many buildings are associated with them. The Germans brought their wine and beer-making skills with them and wineries and breweries, along with neighborhood saloons, proliferated and prospered until Prohibition. Ernst Von Schulenburg wrote Einst und Jetzt (Sandusky Then & Now), the history of the community's Germans. Both the Irish and the Germans left their legacy in schools and churches. Many immigrants were stone masons, attracted to the community because of the large amount of limestone available between 12-18 inches under the soil. The collection of limestone buildings that resulted, in virtually every style of Victorian architecture, is unequalled elsewhere. Three industries have had a profound influence on the community. The Hinde & Dauch Paper Co. revolutionized the shipping industry with the invention of the corrugated shipping box. H&D had factories, mills, and offices all over the eastern U.S. It has been sold to the West Virginia Pulp & Paper Co.
Ellie Damm, President, Old House Guild of Sandusky, Sandusky Multiple Resource Area, Erie County, Ohio, nomination document, 1981, National Park Service, National Register of Historic Places, Washington, D.C.